Silicone brake fluid offers a variety of benefits over traditional glycol brake fluids, making it ideal for Historic vehicles and vehicles that are unused for long periods of time. SBF (silicone brake fluid) is non-hygroscopic, meaning it does not absorb water. Glycol based fluids are hygroscopic and absorb water which can lead to corrosion of metal components within the hydraulic system - this is why Glycol based fluids are recommended to be changed on a regular basis. SBF is also non-corrosive, so it will not degrade the metal or rubber components in the hydraulic system. 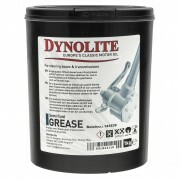 It is compatible clutch and brake systems traditionally using glycol fluids. It can be used to replace glycol fluid in an existing system; ensure the glycol fluid is thoroughly drained, then refill and bleed the system with silicone fluid. Unlike glycol based fluids SBF does not need to be replaced. If new a hydraulic system is filled purely with SBF and no glycol fluid is present, it can last the lifetime of a vehicle.Also, it has a wide operating temperature range from -50° to 260°C, and its boiling point (260°C) is maintained throughout the life of the fluid. It is manufactured to DOT 5 specifications and used by the US military for their light vehicles. SBF will not damage paintwork if spilt, making it ideal for show cars. It resists the formation of mould and bacterial degrading.